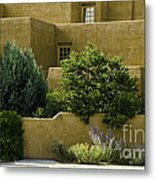 Queen duvet cover (88" x 88") featuring the image "Santa Fe Woman With Umbrella" by Madeline Ellis. Our soft microfiber duvet covers are hand sewn and include a hidden zipper for easy washing and assembly. Your selected image is printed on the top surface with a soft white surface underneath. All duvet covers are machine washable with cold water and a mild detergent. It is an honor for me to have this photo featured in Color Wonderful Photography group! Thanks R Allan for your wonderful comment. 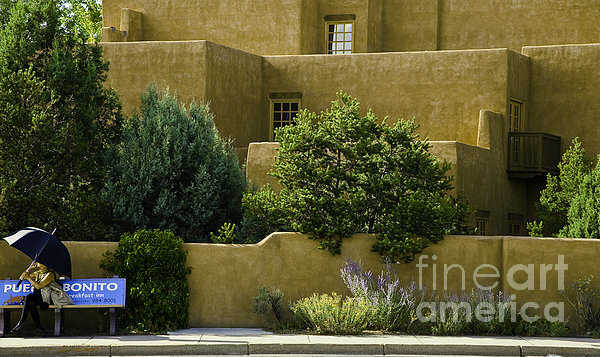 Santa Fe does inspire! The woman with her umbrella gives perspective to the size of the building. This is a really interesting composition. Great work. Once you visit the Santa Fe, Taos, Albuquerque area, you learn quickly why so many artists live and work there. PS, I'm NOT one of them! Wow! Look at the lighting and texture work here and that little figure with the umbrella. Impressively done! Love it! Lenore, thanks. I was on a bus and I saw this woman with her umbrella. I hoped that my bus wouldn't pull away so I could get the shot. Must be a cool place to visit, lucky you. This is a cool shot that really offers a taste of the place. Nice work. 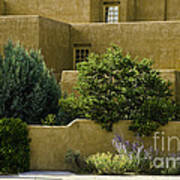 Chris, I wanted to go for many years to Santa Fe, but always went to someplace that seemed more exotic. Thanks for your comment. I appreciate it. A woman sits at a bus stop. She holds an umbrella to shield her from the strong Santa Fe sunset. 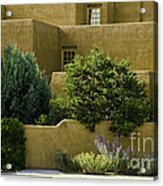 An adobe style house with trees is the backdrop.